Matriarch of alleged killer family said victim was "like a daughter." Now Angela Wagner, her husband and their sons are charged with 8 counts of murder. Angela Wagner once told reporters that Hanna Rhoden was "like their daughter," and that whoever killed her and seven of her relatives on an Ohio marijuana farm were "monsters." But on Tuesday, Wagner, her husband and their two adult children were identified as the people who carried out the gruesome execution-style killings in the tiny town of Piketon back in April of 2016. 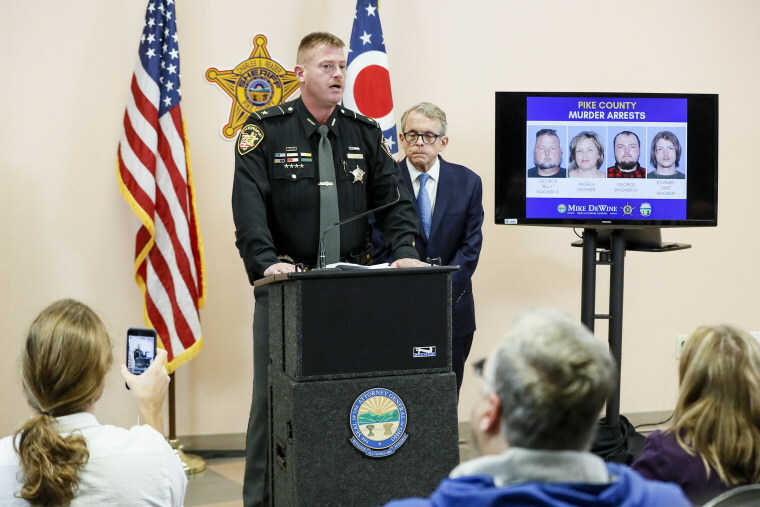 All four have been arrested on capital murder charges in a case Ohio Attorney General Mike DeWine described as the "most bizarre" he's encountered. While a custody battle between to the families appears to be the possible motive, officials would not provide specifics. The Wagners were once close with the Rhodens. Angela Wagner, 48, told the Cincinnati Enquirer last year that her husband, George "Billy" Wagner, 47, was "best friends" with Hanna's father, Christopher Rhoden, Sr.
DeWine said the Wagners used their familiarity with the Rhodens to plot their murders, studying their routines and the layouts of their homes. They shared information about their sleeping locations, and "countersurveillance devices present on their properties, including pets," DeWine's office said. “It was meticulously planned. They knew what they were doing. They thought about it. A lot," DeWine said. Eight members of the Rhoden family were shot to death in four separate homes on their farm in the middle of the night on April 22, 2016. Christopher Sr. was shot nine times. Hanna Rhoden, 19, had been shot twice in the head. Her five day old baby Kylie was in bed with her, but unharmed. Prosecutors said Tuesday it was a custody fight over Hanna Rhoden's other daughter that apparently sparked the Wagners' murderous plan. That girl, Sophia, had been the subject of a custody battle between Rhoden and her ex-boyfriend - Edward "Jake" Wagner, 26. DeWine, now governor-elect, said the Wagners had a "fixation" on the custody fight. "There certainly was obsession with custody, obsession with control of children," he said, declining to elaborate. Jake Wagner and his mother Angela Wagner had denied there was a custody dispute in email exchanges with the Enquirer last year. They said there was a custody agreement they had simply wanted to formalize. That agreement had Sophia, then 2, in Jake's custody on the night of the murders. She was due to be returned to her mom's care that day. The Wagners publicly emerged as suspects last year, after authorities executed search warrants on their properties. They moved all the way to Alaska, in part, they told the Enquirer, to spare Sophia questions about what happened to her mother, but news of the case followed them there. They eventually returned to Ohio at some point, and were indicted by a grand jury on Monday, officials said. In addition to murder, Angela Wagner and her husband and Jake Wagner and his 27-year-old brother, George Wagner IV, were charged with forging custody documents. Angela's mother and her husband's mother, meanwhile, were charged with lying to investigators about the case. Officials said the pair, Fredericka Wagner, 76, and Rita Newcomb, 65, were not involved with the killings. Jake Wagner was also hit with an additional charge — unlawful sexual conduct with a minor. The indictment said he and Hanna Rhoden had a relationship when he was 20 and she was just 15. Officials said the Wagners don't yet have lawyers, but they've repeatedly denied being involved with the slayings. "Please let's concentrate on finding the real monsters who did this," Jake Wagner and his mother told the Enquirer in one of their emails last year. Sophia is now in the custody of state child welfare services, officials said. Also killed in the bloodshed were Christopher Rhoden's ex-wife Dana Rhoden, 37, and their three children, Hanna, Christopher Jr., 16, and Clarence “Frankie” Rhoden, 20. Frankie Rhoden’s fiancée, 20-year-old Hannah Gilley was also murdered, as were Christopher Rhoden Sr.’s brother, Kenneth Rhoden, 44, and a cousin, Gary Rhoden, 38. While searching the crime scenes, officials found more than 100 marijuana plants, which led to specualation the murders were drug-related. DeWine said the drugs were an "undercurrent" in the case, but did not elaborate.